Spring is in the air with gorgeous blooms everywhere. There’s nothing like a bunch of flowers to bring a bit of spring into your home or office. Even better if they are permanent and will never wilt or die – made of felt; Plus there’s upcycling involved! These felt poppies are incredibly quick and easy to make, perfect for lazy crafters like me. Shoe sticks (the thick plastic sticks that come with shoes to help them retain their shape). Gather your supplies at one place. We start with the base, rinse the tin can thoroughly and remove the label. 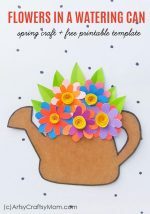 Cut patterned paper to the size of the tin and stick with hot glue. 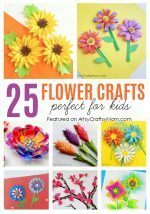 Cut out the flowers using the template or die. To give the flowers a 3D look cut out one petal all the way to the centre of the flower. 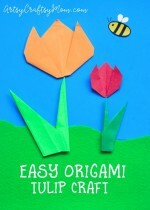 Slightly overlap and glue the first and last petals together with some hot glue. Be careful to apply only a thin layer of hot glue as glue spillovers look very ugly on felt. Stick the flowers on to the shoe sticks with hot glue and place them in the tin to finish your poppy bouquet. Use your Red Felt poppies to make Memorial Day poppies, or put the big, colorful blooms in a vase to brighten up any room. 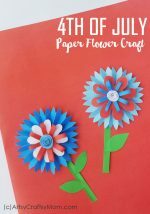 Simple felt poppy crafts make great gifts for Mom, Grandma or a favorite teacher, and are easy enough for young crafters to make with a little bit of adult assistance. So pretty, good tip about the hot glue too, thanks. Red is my favorite color and I always love crafting with felt. Thanks so much for this fun tutorial for making a felt poppy! Thanks so much for sharing at The DIY Collective this week too! Hope to see you again! I am looking for wool felt as the acrylic one is not so sturdy, any ideas where I can buy them in Mumbai or online. Thanks.